[New] Now users can disable Web Diary feature if they don’t want to share their diary post at all. [New] Added “Shared” and “To be Synchronized” nodes in the Web Diary view. [New] Added support for batch comment management, such as batch comment deletion. [Change] Calendar view and Tag view are merged to become Entry view. [Change] Removed the comment status nodes under all Comments nodes. [Solved] Inserting certain pictures with wrong file extension would cause an error. [Solved] Diary may block the system from shutting down properly. [Solved] Trying to access Spell Check option from Spell Check dialog will cause Diary to stop responding. [Solved] Aborting sharing of Diary post that contains picture may cause an error. [Solved] Under very rare cases adding a photo into Album may cause an error. [Solved] Photos backed up from Picasa are not of original sizes. [Solved] Sometimes “To be Synchronized” node may show incorrect entries. You may also follow us on our Twitter at http://twitter.com/diarysoftware for updates on Diary development. [New] Added a new Shiny Silver theme. [New] Added the ability to reorganize Entry and Photo tag by drag and drop. [New] Added the ability to align vertically within a table cell. 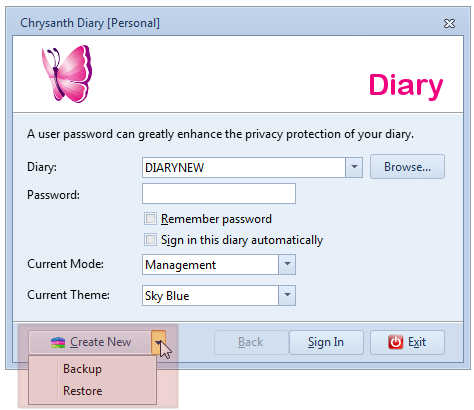 [New] Added diary backup feature before upgrading diary database. [New] Now Diary Editor allows picture attachment to be added. [New] Added the ability to add and edit calendars in My Organizer. [Change] Now Diary will prompt for saving before an entry is printed. [Solved] Entry Printing fails to work properly. [Solved] When a photo has already been inserted into an entry, it is unable to add the same photo into Album again. [Solved] Under certain circumstances, when picture of a diary post fails to upload, it may cause Diary to get stuck at the process. [Solved] Deleting an entry should remove relevant task from Task List. [Solved] Exiting Diary when there are other windows being shown will cause an error. [Solved] Unable to browse entries not visible in the entry list via Entry Browser’s navigation buttons. [Solved] After editing an entry via the most Recent entry list in Diary Editor, clicking at the list again will cause an error. [Solved] After saving a new entry, the filter hint in All Entries tag will disappear. [Solved] Newly added photo to a tag that is currently being displayed is not visible immediately. [Solved] Right clicking at the border of a table will cause an error. Today we just released the feature of Private Web Diary, all existing users of Diary may create a private diary now that is only accessible by the diary owner, plus people invited by the diary owner. [New] Added My Organizer module for better personal information management. [New] Added watermark effect to photo plugin. [New] Added Select All menu item when right clicking at the Diary Editor. [Solved] Adding Flickr web album or sharing photos to Flickr will cause an error. [Solved] Double clicking at photos uploaded to default web album does not launch web browser to visit the photo page. [Solved] When importing HTML files, pictures with relative path are not imported properly. [Solved] There would be an error when saved password is not retrievable. [Solved] The No Fill and Transparent color option for highlight and fill color are not visible in the UI. [New] Added batch printing function to print entries. [Change] Diary Editor’s default font has been changed to Segoe Print. [Solved] Trying to back up photos when adding new web album account would cause an error. [Solved] Sometimes performing a search in the Search window may encounter an error. [Solved] In Calendar Month view, the hint shows the wrong date for entry found in the month. [New] New options for when main form is being closed. [Change] Improved the speed of loading some module data. [Solved] Deleting entry in calendar view does not work properly. [Solved] Text after horizontal line will be displayed as a block of black box during preview. [Solved] New entry should show up immediately in Private tag upon saving. [Solved] Sometimes entries in the Private tag are not displayed according to the Date range filter. [Solved] Sometimes calendar in Month view is not highlighting dates with entries. [Solved] Entries in Month view will be shown in ascending entry date order by default. [Solved] Entries in Tag view should be shown in descending entry date order by default. [New] Added a monthly calendar to Month View to highlight dates containing entries. [Solved] Setting up Web Album account that contains long album name will cause an error. [Solved] Calendar in Date View sometimes does not show proper highlights for dates containing entries. [Solved] Importing HTML files into same editor should not overwrite existing content. [Solved] Sharing entry to Web Diary may sometimes encounter an error. [New] Added a Cool Black theme. [New] Added batch import support for TXT, RTF and HTML files. [New] Now everyone could sign up for a free Personal Web Diary via Diary. [New] Added the ability to Tag photos locally or when photo is shared to web album. [New] Web album will now show the relevant site’s icon for easy idenfitication. [New] Now you may use arrow keys to navigate in the Search Result window. [New] Added Copy function to Browse window. [New] Added Browse function to entry Search window, now double clicking at entries found will default to browsing. [New] Added “Private”, “Shared”, “All Entries” and “To be Synchronized” system tags to organize diary entries. [New] Importing TXT, RTF or HTML file into diary editor would make use of filename or HTML title as entry title. [New] Added a CTRL+F shortcut key to the Search function in the main window. [Change] Local Album view has been redesigned as Tag view. [Change] Clicking at Web Album account node will now show all albums for the account. [Solved] Clicking at the root node of Web Album should show all web albums in the grid. [Solved] When trying to share a photo not yet downloaded from web album, users should be alerted. [Solved] The “Insert Photo From Web Album” window should indicate photos that are not downloaded with a shortcut icon. [Solved] When entry title is cleared, users should be prompted to save entry before diary editor is closed. [Solved] Sometimes an error may arise trying to resume tasks in the Task List. [Solved] There is an error deleting web diary post. [Solved] Sharing web diary post in the Entry Browser list may share the wrong entry.